In Pompeii you lived well: there were some opportunities for fun and entertainment,as the shows with gladiators. The wealthiest citizens, seeking consensus for political office, organized the ludi, the games, which were those of the Circus (ie chariot races like in the movie Ben Hur), or the theater, or in the Amphitheatre, which was the place for gladiatorial shows, which were the most loved and followed ones. In Campania there were many of the most famous schools for gladiators, as in Capua, where he began the revolt of Spartacus. 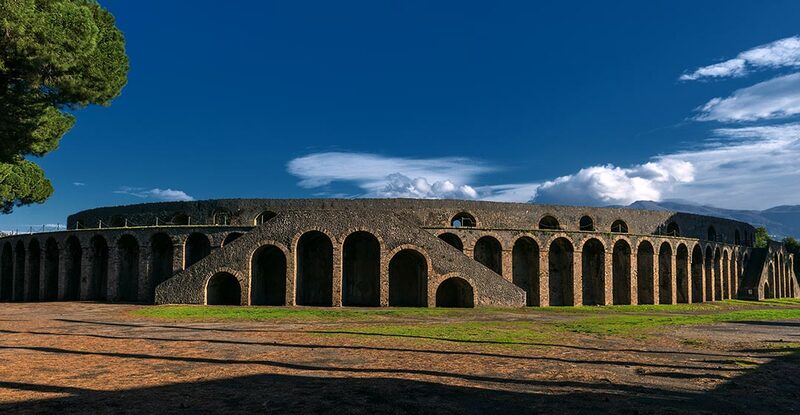 In Pompeii it is one of the oldest amphitheatres in Italy, to witness to the wealth of the city and the charm of this show for its inhabitants. The gladiators were prisoners of war, or condemned, but in some cases they were free men who loved adventure or needed to decided to engage in a trade that could make them rich and famous (and appreciated by women, who for most famous gladiators were willing to do follies). 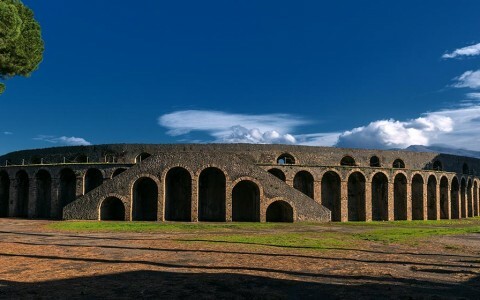 In Pompeii you can visit the barracks of the gladiators and the quadrangle where they lived in the time of the eruption. Here he was found dead a matron (a woman of good family) bejeweled: she had come to say goodbye for the last time to her lover warrior? The gladiatorial games were the highlight of the amphitheater show, which provided first hunts for wild animals and other bloody spectacles. The two athletes / warriors defied armed in the same way: a retiarium was armed with a net and a trident and challenged his opponent who had a sword, or a spear, or two knives. There were the specialties and the specific roles. In the end there was a winner and a loser, that only rarely was killed (a gladiator cost much to his owner / entrepreneur) and only if this was cowardly in combat. But bloody battles between gladiators were not the only fun in Pompeii: also the theater was much loved by the people, and infact there are two theaters in the city. One, the smallest one, was covered and it was for the music performances. The other, however, still used in summer for live shows to witness the continuity of life in Pompeii, was intended to theatrical performances. Surely they represented the ancient Greek tragedies, which were not, however, the most popular ones. More popular were the comedies, where various typical characters – the old fool, the wolverine, the wily – performed in comedy scenes, often with obscene and vulgar jokes. It is, in some way, the ancestors of the masks of the Commedia dell’Arte, and how these, in fact, acting provided the masks that were used both to identify the character, and to amplify the voice. hen there was the show of mime, which was much loved and that gave rise to real stars acclaimed by the public and of which we still know the names. And there were also women, which in classical theater was not planned, since all roles were covered by male actors. These actresses had bad moral reputation, and in fact often their mimic activity ended in a striptease, that pleased the audience but that certainly did not increase the moral credibility of the protagonists. Even gymnic games were much loved by the inhabitants of the city of the Empire, and then also in Pompeii we find gyms where young people – and young girls too – could train for athletic activities and then perform in Olympic type games. The city was, moreover, full of taverns and inns – the thermopolia – which made what is done in all the taverns of the world. In Pompeii you can still see the taverns with the bank and the space in which amphorae with wine and hot drinks were preserved. A bench very similar to those of the bars of today is perfectly recognizable, and in some cases, you can also see the insignia with the name of tenutario. The wine was drank mixed with water because it was a syrup that was inevitably stretched. And then there were the latest entertainment, those made with women who practiced the oldest profession in the world: the prostitutes, who were of all kinds, from those who exercised in the street, at intersections (the trivi, who then gave Use the word “trivial”) and those that worked in brothels, places open to the public only for this purpose. Lupa in Latin means precisely prostitute and the Etruscans, whom considered the Romans rude and vulgar, accused the founders of the city, the famous twins, being in fact the children of the wolf, and did not refer to the animal.